We explore the human affective state of the familiar during a new or unknown situation as it relates to interacting with a robot. In a real unannounced interaction, we measure the familiar experienced by two humans interacting with a robot and the intensity and adequacy of their response to its proactive social (greetings) and practical (task to fulfill) actions. 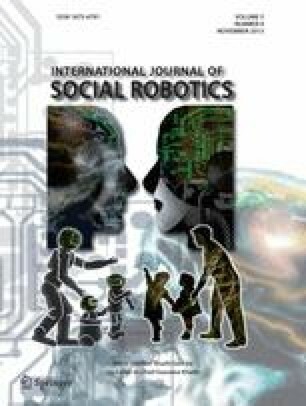 We investigate the participants’ response to three non-verbal actions performed by the robot NAO: greeting hello (social), handing a questionnaire to the participant (practical), and greeting goodbye (social). We analyze the participants’ reactions to the robot’s actions, the motion of their arms, and their answers to some parts of a questionnaire designed to measure their experience of the familiar and the robot’s sociability. We show that (1) the higher the familiar is experienced while interacting with the robot, the more participants responded to its practical action; no similar interdependency was found regarding its social actions; (2) the change of behavior of the robot between participants had no significant effect on the familiar experienced nor on the readiness to respond to the robot; (3) the higher the appreciation of the robot’s sociability, the more intense was the human movement when responding to the social actions; no similar interdependency was found for the practical action; and (4) the more the participants responded adequately to the robot in a practical action, the more they responded to its social actions. The online version of this article (doi: 10.1007/s12369-013-0207-x) contains supplementary material, which is available to authorized users. We mostly wish to thank Dr. Marie Krempf for her enthusiastic and valuable help as well as all the GV lab students, Tokyo Univ. of Agriculture and Technology, Japan.